Japan’s troubled Toshiba has posted a first-quarter net loss for the three months to June as sales fell to their lowest point in two and a half years. The firm said in a statement that its net losses for the quarterly period were 12.3 billion yen ($102m; £66m). It noted poor performances in its televisions, home appliances and personal computer businesses. Last week, the Tokyo-based firm released a full-year net loss of $318m for the year to March 2015. The full-year numbers had been delayed amid a recent accounting scandal. In its first quarter results statement released on Monday, Toshiba said Japan’s domestic economy had not shown signs of acceleration because of sluggish performance by smaller businesses that depended on domestic demand. It also said Japan as a whole was experiencing a decrease in consumer spending due to a decline in real incomes and exports. Japan, which is the world’s third largest economy, last week announced a revised fall in private consumption to 0.7% from a previous estimate of 0.8%. The country relies on domestic consumption for about 60% of its economy. Toshiba said it would not announce a forecast for its full-year to March 2016 figures at this point “as [it] continues to carefully evaluate the operational impacts of inappropriate accounting”. Toshiba’s president and vice-president resigned in July after an independent panel found the company had overstated profits for the past six years. 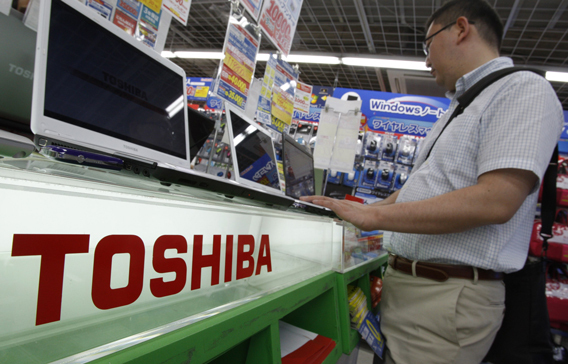 The panel said operating profits had been overstated by $1.22bn, roughly triple an initial estimate by Toshiba. Toshiba has apologised to investors and has made attempts to avoid further accounting irregularities.